Newer Firefox (e.g. 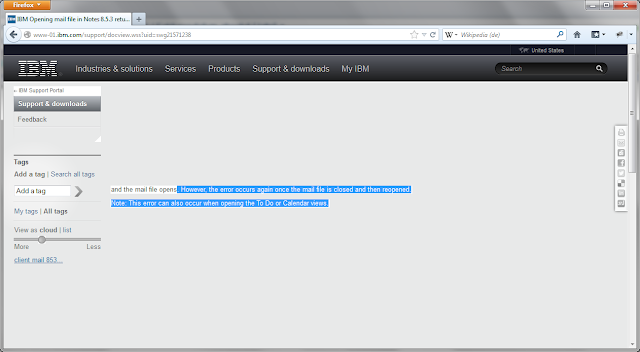 the newest ESR) versions can not render the IBM support website correctly. Many parts of the website are invisible and will show only sporadic on scrolling. I can reproduce this problem on different workstations with different hardware and even on the newest non ESR Version of Firefox. But it is not reproducable in virtual machines. This is a serious problem, because it is impossible to work without the IBM support site. Our first workaround for this was to use Internetexplorer :-((. But now our PC support team has found out, that the problem is related to the hardware acceleration of Firefox. When you disable the hardware acceleration then the IBM site is working as expected again. Funny. I just reported the same problem to their webmasters. Thanks for the workaround. "Like"... Already tried a lot of possible solutions, also reinstalled FF... Thanks a lot !!! - re-enable the "hardware acceleration"
Thanks for the info. Unfortunatly in our company we are on the ESR (Extended Support Release) version. So we have to wait either for a backport to our ESR Version or a new ESR Version.